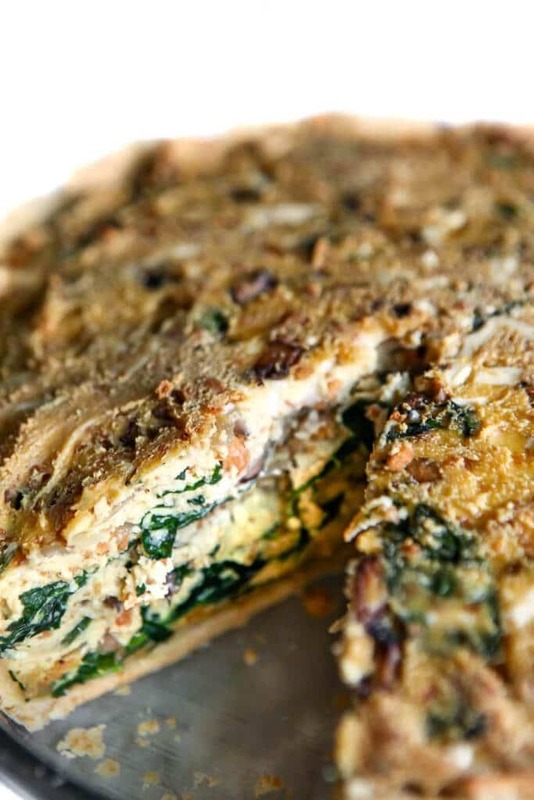 This easy vegan quiche recipe is seriously the best quiche you will ever taste! 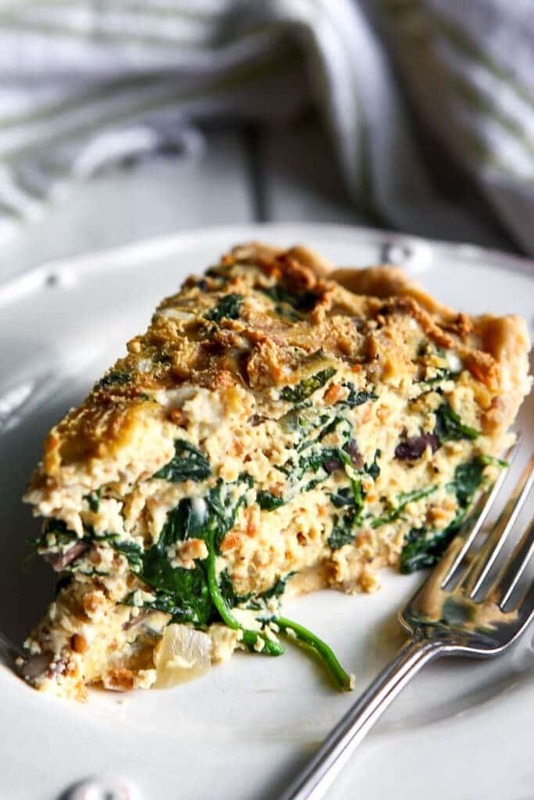 It’s a spin on a classic quiche Lorraine made with tofu instead of eggs and filled with spinach, mushrooms, vegan cheese, and even vegan bacon! It bakes up firm, easy to slice, and delicious to impress your friends and family for Easter dinner or Sunday Brunch! It’s free of most major allergens and it can easily be made gluten-free, so everyone can enjoy it! simply delicious and tastes like a classic quiche! egg-free, dairy free, nut-free and can easily be made gluten free too! the perfect addition to any breakfast, brunch, or dinner. great for making up ahead of time and even re-heating the next day! 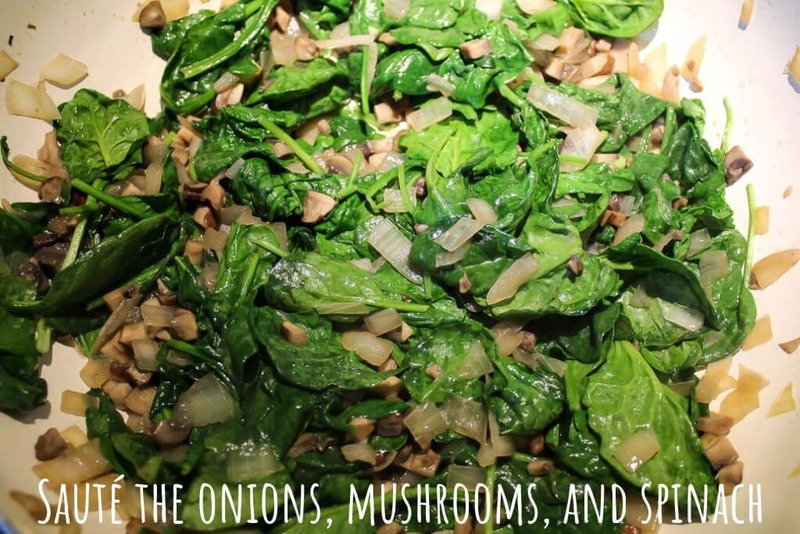 bursting with flavor from the onions, mushrooms, spinach, and vegan bacon! 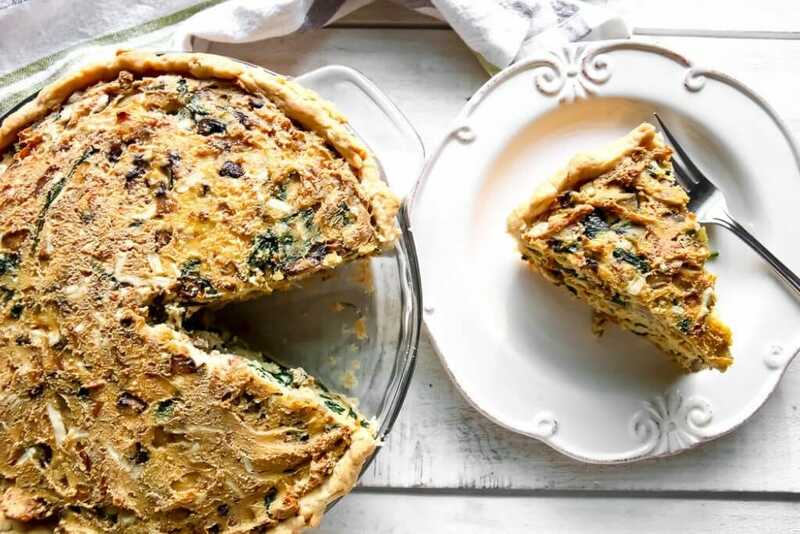 It’s hard to believe that you can swap out nearly every ingredient in a classic quiche recipe and have something that tastes so good, but it’s true! You just have to taste it to believe it! A Pie Crust – I have included my favorite easy vegan pie crust recipe, but you can use your own, or even buy a premade pie crust to keep it simple. If you need it to be gluten-free, be sure to use my recipe for a Gluten-Free Vegan Pie Crust that really works! Tofu – this is the base of this recipe that you need to use to replace the eggs. Use high protein or extra firm tofu. The more firm, the better. Nutritional Yeast – for a cheesy flavor and added nutrition. 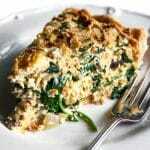 Vegan Margarine – to add to the tofu to give the quiche richness, and to brush on the top to give it a shine. Soy Milk – or any plain flavored plant-based milk to thin out the tofu and make it into a very thick batter. (The amount will vary depending on the firmness of your tofu). Salt and pepper – to flavor the tofu. Vegan Cheese – you can use Daiya or your favorite store-bought vegan cheese. Traditional quiche Loraine calls for Swiss cheese. If you want that classic taste, you can use my recipe for Vegan Swiss Cheese and make your own. 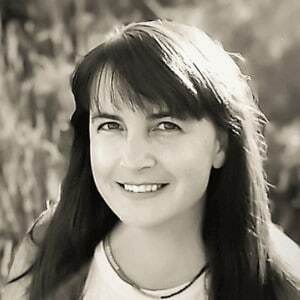 Oil – any neutral oil will work to saute the onions, mushrooms, and spinach. Onion – for flavor. You can leave it out if you don’t like them, but it adds a lot of flavor to the whole dish. Mushrooms – for flavor and texture. (optional but recommended). Baby Spinach – for flavor, nutrition, and to lighten up the quiche. Fresh baby spinach has the best flavor and texture, but you can use frozen if you need to. (Massaged kale also works well). Bacon Bits – or diced up smart bacon for flavor. (Most store-bought bacon bits are actually vegan or you can easily make your own vegan bacon bits with my recipe). (This is also optional, but they give the quiche a nice smokey flavor). Food Processor – to blend your tofu and other ingredients. Large Skillet – to saute the onions, mushrooms, and kale and mix the quiche batter in. Rubber Spatula – to scrape out the tofu mixture and press it into the pie crust. Kitchen Brush – to brush a little vegan margarine on the top after baking. How do I make vegan quiche? Make a vegan pie crust or prepare a pre-made pie crust by lining the bottom of a pie dish with the pastry and pinching the edges. Dice onion and saute it in a little oil over low heat until translucent. Add diced mushrooms sprinkle with a little salt and continue to saute until they begin to release their juices. Add baby spinach and stir for a few minutes until the spinach just barely wilts. Break up tofu into smaller pieces so it fits in your food processor. (You may have to do this in 2 batches if you don’t have a large food processor). Add salt, pepper, nutritional yeast, and melted margarine to your food processor and blend. (It will turn into a crumbly mixture). Slowly add soy milk 1 tbsp at a time blending between each tbsp until the tofu mixture turns from crumbly to a very thick paste. Add the tofu mixture to the sauteed veggies along with vegan cheese, and vegan bacon bits and mix well. 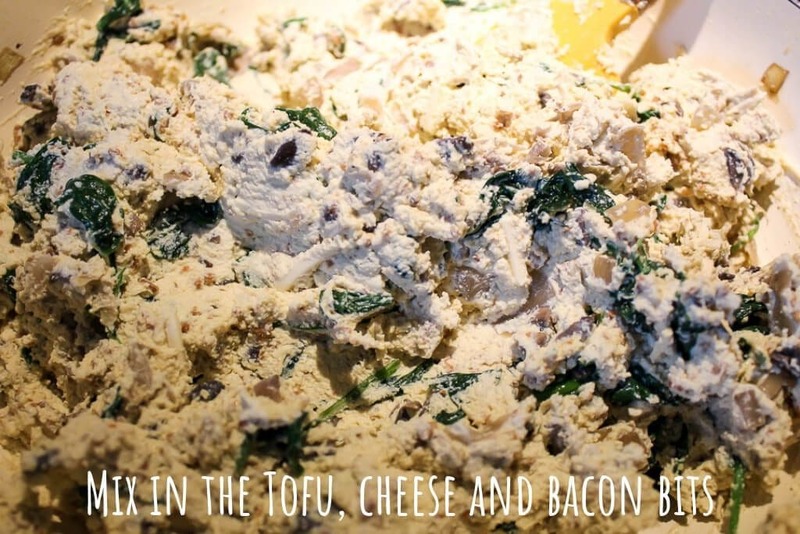 Pour the combined tofu-veggie mixture into your formed pie crust. Pack the tofu down firmly and evenly in the pie dish. Bake at 400° F for 1 hour. Brush the top of the quiche with an additional tbsp of melted margarine if desired for a shiny glow. Let it cool for about 10 minutes before cutting to allow it to set a little and firm up. There are two types of tofu that work best for this recipe. Dense, high protein, shrink wrapped tofu OR extra firm, water packed tofu usually sold in a plastic tub. Both will work but the high protein tofu is preferred if you can find it (Trader Joes carries it if you have one near you). The water packed, extra firm tofu will work but make sure to press it to squeeze out the water. Once pressed, water packed tofu also has slightly less weight so you will need 2 1/2 containers to equal 2 full pounds of tofu. Add just enough milk so the tofu is smooth and not grainy looking. (This will be about 1/2 cup if using the high protein tofu, and only a tablespoon or 2 if using the extra firm tofu). Allow the quiche to cool a little before slicing. This help it set up and come out in a nice solid piece. Can I make a crustless quiche? Yes, if you want to omit the pie crust, you can. This tofu quiche will bake up firm enough that you can get it out of the pie dish in one piece even without the crust. You can also cook the quiche in muffin tins to make mini crustless quiches. Can I use other vegetables in the vegan quiche? Yes! Feel free to swap out the onion, mushrooms, and spinach with things like garlic, broccoli, kale, and bell peppers. All of these veggies make for a delicious quiche. I just always gravitate back to the onion, spinach, and mushrooms because it tastes like Betty Crocker’s Quiche Lorraine that I grew up eating. How do I make this quiche gluten-free? 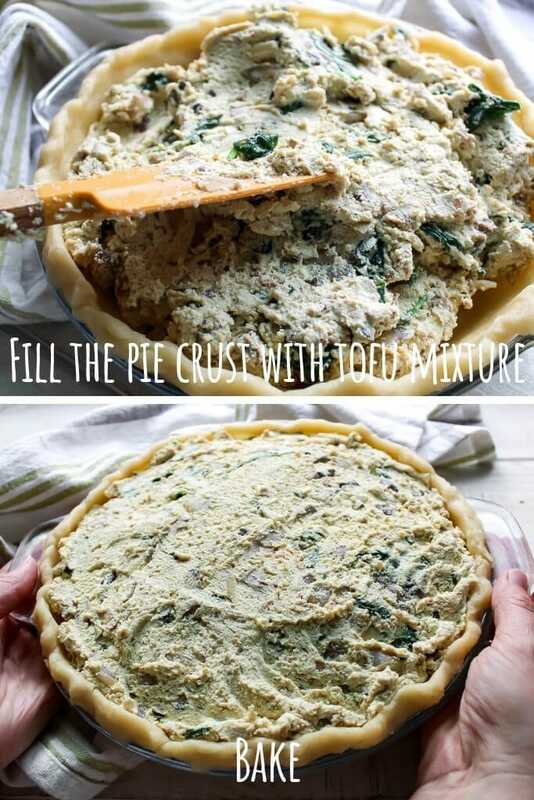 The filling is naturally gluten-free, so you only have to use a gluten-free pie crust to have a gluten-free quiche. You may be able to find a pre-made one at a specialty store, but I highly recommend using my Gluten Free Pie Crust Recipe that Works. I spent years perfecting it and it really is the best gluten-free pie crust I’ve ever tasted! How can I make a vegan quiche without tofu? If you want a soy-free version of vegan quiche, you can use my chickpea bread recipe as a filling for your quiche instead. Add the veggies, vegan cheese, and bacon bits to the basic chickpea bread base and bake for 45 minutes at 400°F in pie crust. Allow cooling for about 15 minutes before slicing. This will be denser than tofu, but equally delicious! Note: to make this soy-free, you will also want to omit the bacon bits since they are made with dehydrated soy protein. 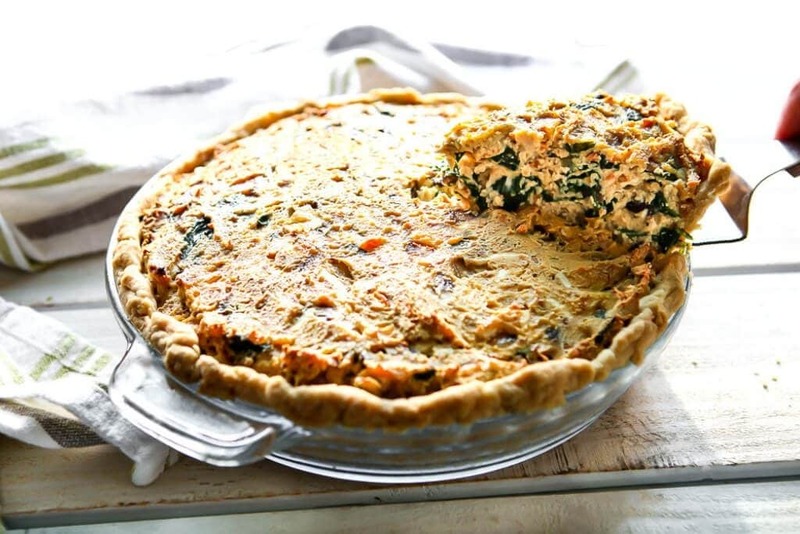 Be sure to pin this vegan quiche for later! 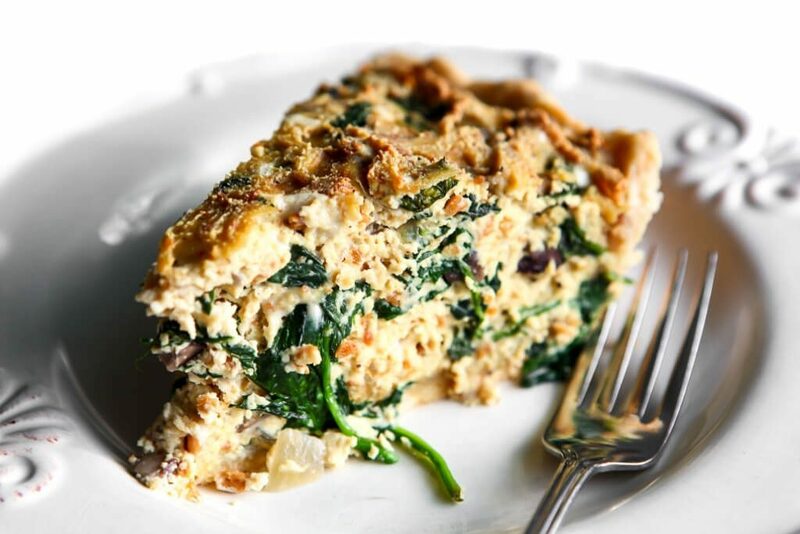 A vegan quiche made with tofu, spinach, and mushrooms. 1 tbsp melted margarine optional for brushing on the top after baking. Mix the dry ingredients in a bowl then pour in the oil and boiling water and mix well until it forms a ball. Place the ball of dough on a piece of parchment paper and push it flat and cover with the 2nd piece of parchment paper. Use a rolling pin to roll the dough flat between the parchment, then peel off the top sheet. Use the bottom piece of parchment to help you flip the crust onto the pie dish and peel off the second piece of parchment. Pinch around the edges forming the pie crust into an even edge. Add diced mushrooms sprinkle with 1/2 tsp salt and continue to saute until they begin to release their juices. Break up tofu into smaller pieces so it fits in your food processor. (You may have to do this in 2 batches if you don't have a large food processor). Add the remaining 1 1/2 tsp. 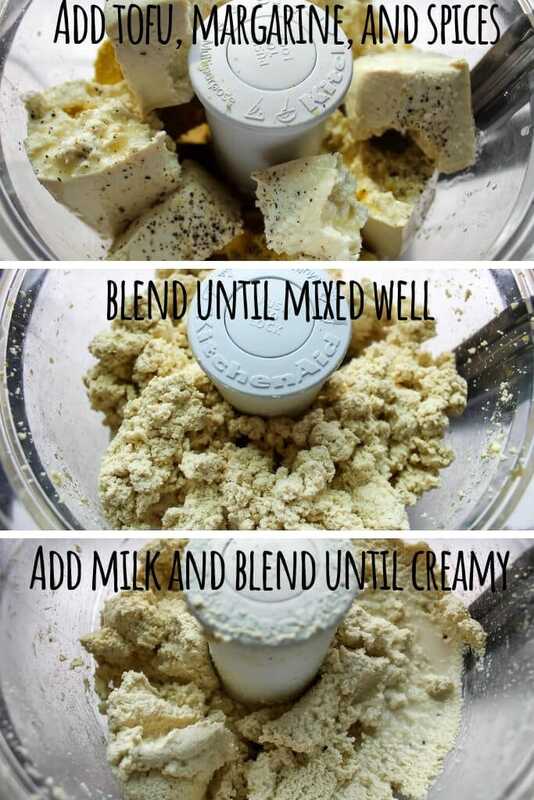 salt, pepper, nutritional yeast, and melted margarine to your food processor and blend. (It will turn into a crumbly grainy mixture). Slowly add soy milk 1 tbsp at a time blending between each tbsp until the tofu mixture turns from crumbly to a very thick paste. (If you don't use the high protein tofu, you may not need much milk). Pour the combined tofu-veggie mixture into your formed pie crust and pack the tofu down firmly and evenly in the pie dish.